I am still catching up on my Weekly Bakes posts. 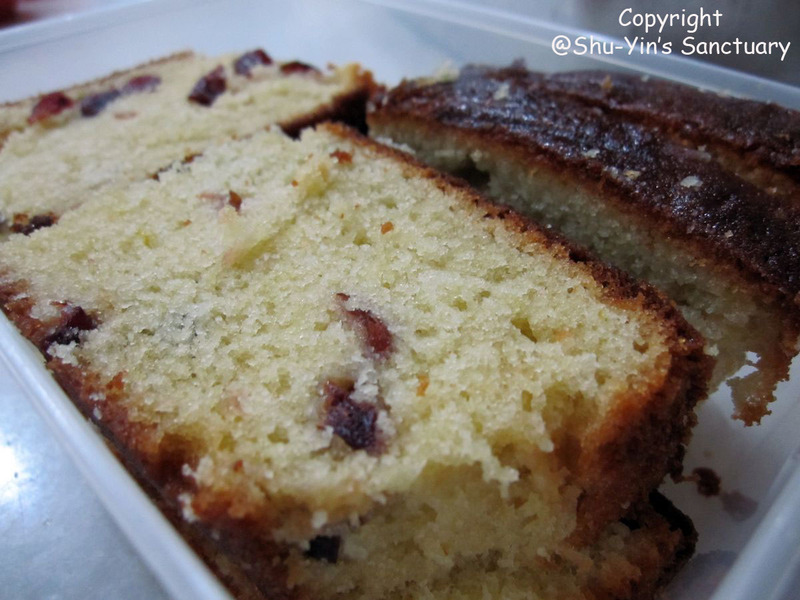 This Lemon Cranberry Pound Cake was actually baked on 14 June 2010, nearly a month ago. 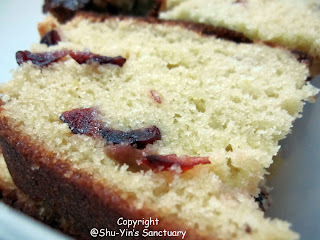 This recipe takes a rich and buttery pound cake and stubs it with lemon laced dried cranberries. It was an instant hit! We finished up even the crumbs! 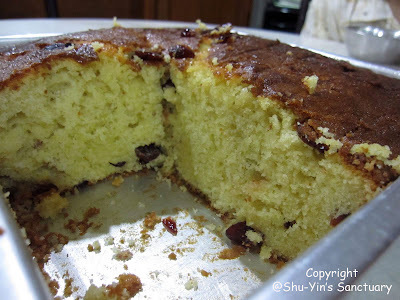 Next time I think I need to flour the dried cranberries before I add them into my batter because they turned out nearly all sank at the bottom of the cake. Hopefully by coating them with flour, I can eliminate this problem. This is a definite must-bake cake if you love tangy yet rich buttery flavour. Oh btw, this recipe calls for a bundt pan but I don't own one so I used a 9-inch square pan. In a small saucepan over medium-high heat; bring the lemon juice, brandy, and dried cranberries to a boil. Cover and remove from heat. Let cool completely and then drain, reserving the cranberries and the juice separately. In a separate bowl whisk together the flour, baking soda and salt. Set aside. In the bowl of your electric mixer, or with a hand mixer, cream the butter and sugar until light and fluffy. Add lemon zest, vanilla extract and eggs, one at a time, beating well after each addition. Scrape down the sides of the bowl. With mixer on low, add 1/3 of flour mixture, alternating with the sour cream, about 1/2 cup at a time, beating just until batter is smooth. (You will have three additions of flour and two of the sour cream.) Stir in the drained cranberries. Pour batter into bundt pan and smooth the top with a rubber spatula. Bake for approximately 60 - 75 minutes or until a toothpick inserted into the middle of the cake comes out with a few moist crumbs. Remove from oven and place on a wire rack. Let cool 5 minutes and then lightly brush the top of the cake with half of the reserved cranberry liquid. After 10 more minutes loosen sides of pan with a sharp knife and invert onto a wire rack. Immediately brush the top and sides of the cake with the remaining cranberry liquid. Cool the cake completely. Dust with powdered sugar before serving. If not serving immediately wrap the cake well with plastic wrap and refrigerate or freeze. Wau...look very nice. I'm sure it taste good. Make my fingers 'itchy'. It's been so long since I bake. 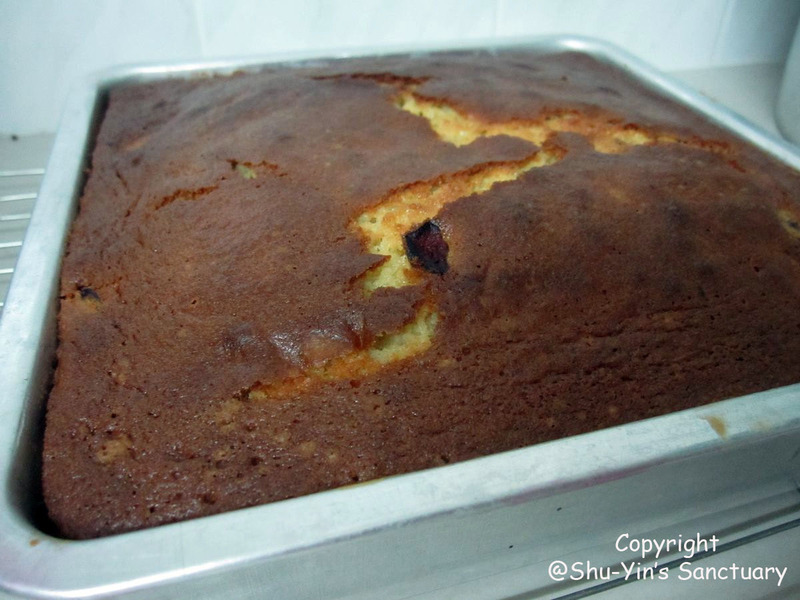 You follow exactly the recipe from 'joyofbaking'? Or do you modify abit? well, i did modify a bit...usually i do so especially if i cant find some of the ingredients. for this recipe: for cranberries, i did not add in any brandy. instead i added in some sugar...just a little...so that it wont be so sour with just the lemon juice. and of coz i didnt use pure vanilla extract. I used vanilla essense. Are you seriously baking every single week??? How many hours do you spend baking each time? I don't have that time luxury for sure. karen...i bake ALMOST every week. sometimes may skip a week here n there. erm..time spent depends on what im baking. if it's muffins...is real quick. batter prepared in 15 mins and bake in the oven for 20 mins and then done. 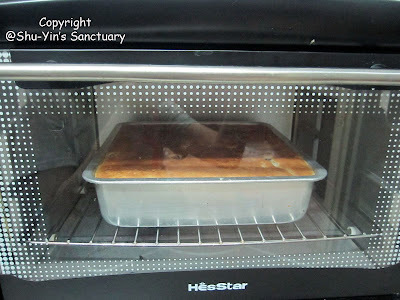 but if cake, then usually preparatime time needs more n baking time is also almost an hr. good for you, enjoy yr hobby!